Mark Richards posted this pic this morning by Brian Bielmann. 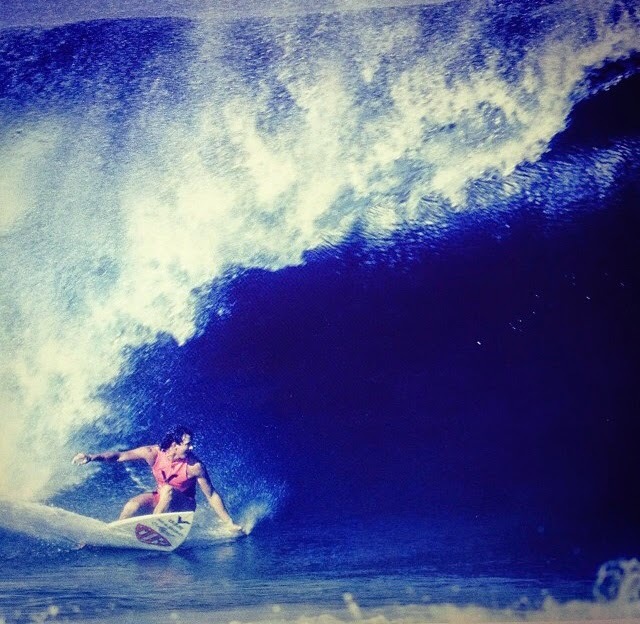 "Pipeline Hawaii, mid 80's. Weirdest thing, I'd just arrived in Hawaii and driven out to Haleiwa stopping for a burger for lunch. 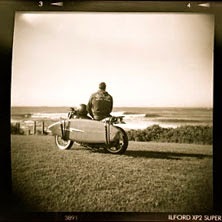 I grabbed an issue of the latest Free Surf and was flicking through it and discovered this shot of me. 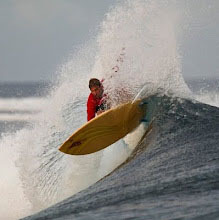 I was so stoked to see it, its a rare event to get a shot in a surf mag these days. 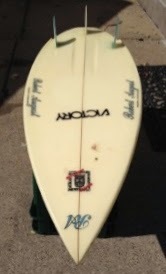 I don't remember the exact year but the board was a 7' 4", 19" wide and 2 3/4" thick. 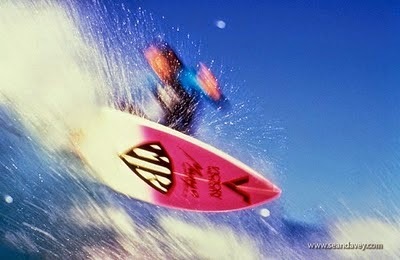 It was a thruster that I had shaped from a Burford blank in Australia. The tail had a wing swallow, with a round wing / flyer and the bottom shape was a flat panel fee. 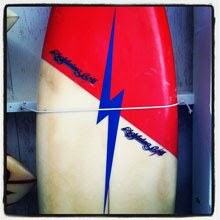 Another board I don't have but wish I still did." MR's post prompted me to pull the following pics out. 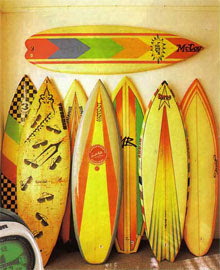 We can be forgiven for getting over excited when finding an old board bearing a collection of some of the most iconic logos from the 80's. Especially when this collection of logos belonged MR. 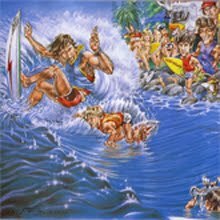 Although I stopped following competitive surfing in 1988 I feel that I can safely predict that no one will ever win more than 4 world titles in a competitive surfing career. 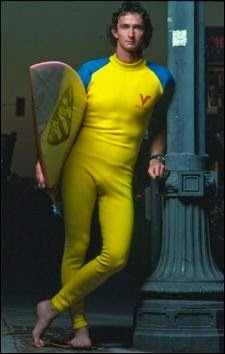 Therefore I proclaim Mark Richards to be the greatest surfer of all time! What?! Kelly from Florida? Who is she?! MR's designs were as sought after at the times as they are now. 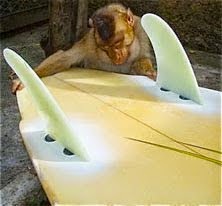 So its no surprise to learn that he and other board makers made many replica's of MR's competition quiver to use as promotional items. 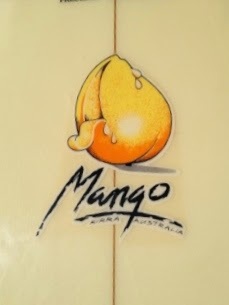 "Hi - I worked for Mango at the time and can tell you that this Mango Logo (above) pre dates this one "Victory Wetsuits / Mango Surfwear team board mystery." 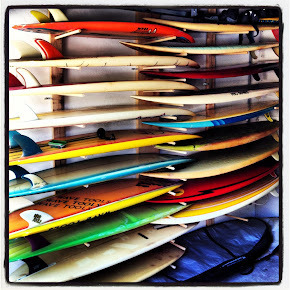 Who shaped the boards? i have no idea...though was near the end for Mango. " 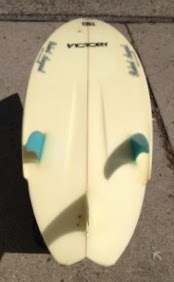 "Hi- I recently picked up a Robert August Mango Victory team board, I was cleaning it up today and the same thing no markings of dimensions or shaper or numbers of any kind,the board is pretty solid,has a bright green to bright yellow fade on the top,its 5'9" and is a pretty sleek tri fin....fits right in with my collection......aloha "
"Hey mate, this board might be from lennox, Victory wetsuits was the huge brand in town at the time and Mango was owned by Donnie Munro at the time as well, Mango and victory sponsored LE BA our local boardriding club." "Not mine mate but I know Mark Richards rode for those companies so could be his. I will forward to him and see what he says, cool?" 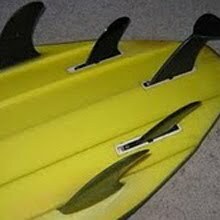 "Hi- I stumbled across your site and blog while researching a Robert August board I came to own for about the past 20 years. In my research I came across your site and found myself reading and enjoying the photos for hours. 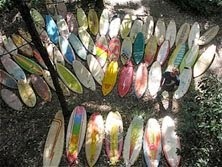 Thank you for your efforts - it warms my heart and toes just reading about surfing and the community. I have no way of knowing if I have something of value - or if it is pure junk. 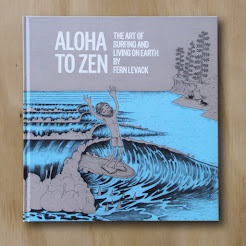 I bought this out of a land locked beach / surf themed bar in Denver Colorado. 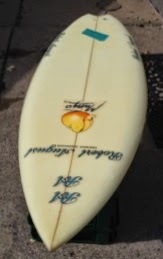 I was told at the time when they launched the bar they had some big name surfers stop out at the grand opening weekend and dedicate a surf board to the bar for decoration. This board - among others - was suspended from the ceiling of the bar by wire - through three holes drilled through the board itself. 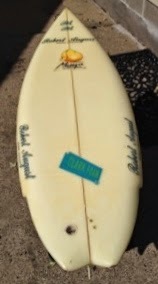 When I bought the board it was covered in wax - which I removed - and a few beat up stickers - I also removed to see if there was further damage. 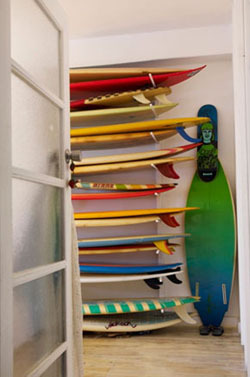 I displayed the board in my home as a cool decoration but for the past 15 years it has been in storage here in Minnesota (read Minnesota as cold and land locked AKA miserable). 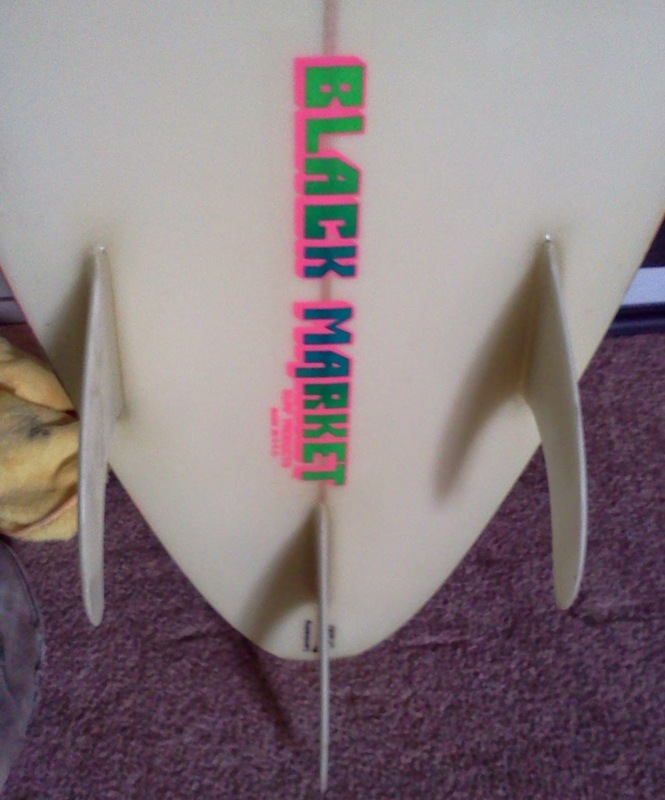 The board is 5 ft 1 inch (a bit shy of 1.6 meters) and is about 18 inches wide (a bit over .5 meters) wide. 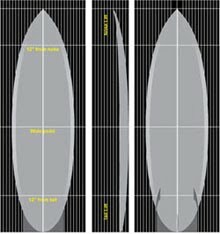 Can you give me a quick opinion on my Robert August board?" "Hi- Mystery solved. 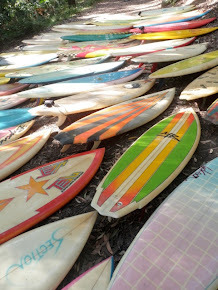 I tracked down and reached out via email to the founder of Mango Surfwear, a super nice guy named Don Munro. 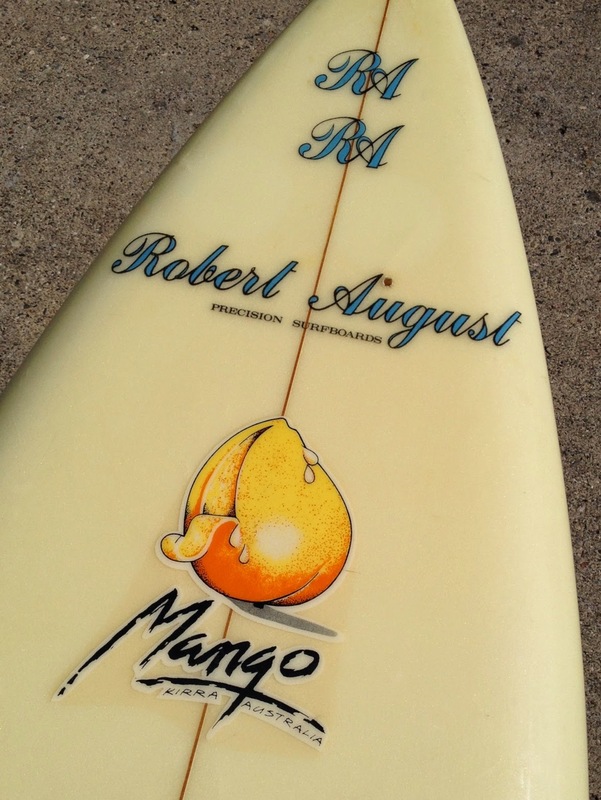 Don replied sending the email below to fill in the details around the Mango / Victory - Robert August Surfboards. - Bill"
Hi Bill- My apologises for the delay in replying to your inquiry. 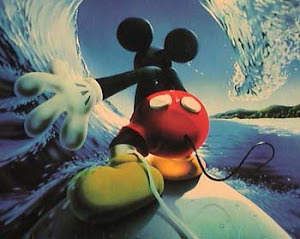 There is a very simple explanation.....as the Founder/Owner of Mango Surfwear in 1994 I traveled to the US & negotiated with the owners of Victory Wetsuits to be the USA licensee of the Mango brand! This explains the correlation of the two brands & the connection with Robert August was he was a friend of the VW owners. The board being the size it is it could have been originally used for promotional/display purposes. I hope this solves the mystery for you! "Hi, I came across your article about your mystery victory/ mango marked Robert August and figured I'd share this with you. 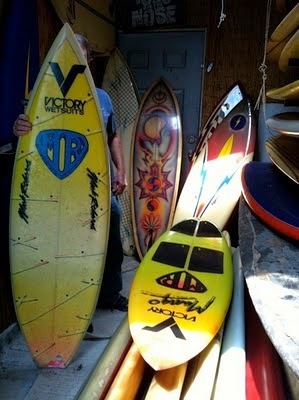 Its somewhat a mystery board, built by Bruce Grant and held in his personal collection until recently. 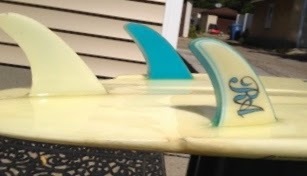 I have no other info on it.........."
how do I get in contact with this guy who has that Tom Eberly Twin fin..
That board has been on my mind for years... I would be happy to purchase or trade on that baby..
email anytime Bolt owner !! 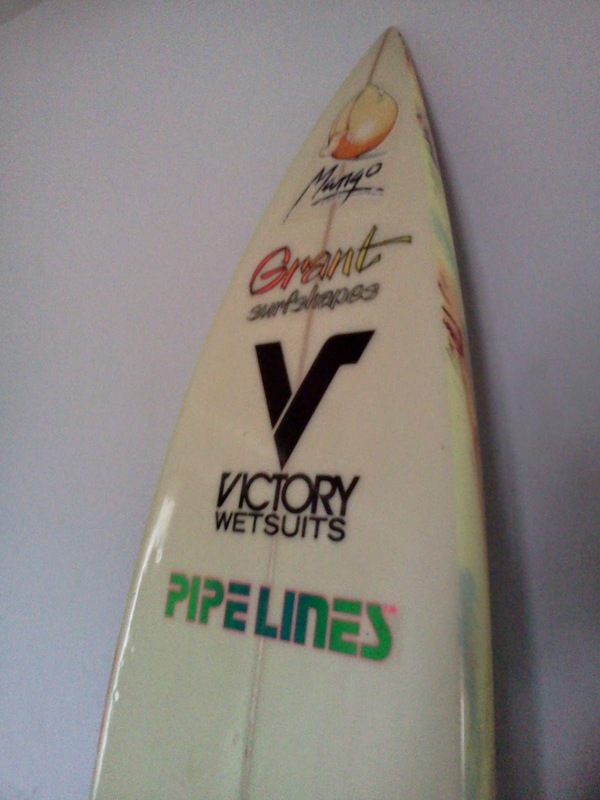 That was Bruce's step up made for himself.He was a Rep for Victory Wetsuits and Mango always went along with Victory.I remember that board when it was new.Bruce used to shape for Con Surfboards at the time.This was like 1989 to maybe 1990 when he shaped this.That was just after we all worked on the movie "Back to The Beach"